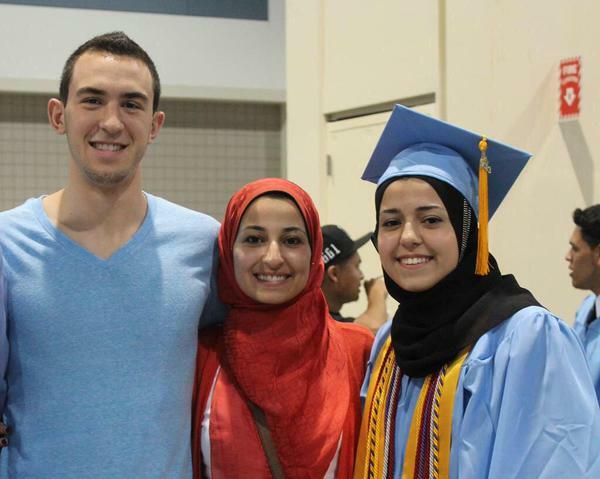 On Tuesday, Craig Steven Hicks, an ordinary man from Chapel Hill, a town of 60,000 inhabitants in North Carolina, took his gun, walked across the street and killed three people: Deah Barakat, Yusor Mohammad Abu-Salha, Razan Mohammad Abu-Salha. All three are American citizens, and Muslims. Police have arrested Craig Stephen Hicks and charged him with first-degree murder in a crime that has sparked a heated debate over whether Hicks was fueled by hate against Muslims – or, as the police say because of a dispute over parking. According to NPR, family members of the victims and Hick’s ex-wife painted different portraits. Hick’s ex-wife stated he was an „anti-theist“, without hate about any articular religion, but obsessed with the movie „Falling Down“. Falling Down told the fictional story of an unemployed defense worker frustrated with the various flaws he sees in society, and who begins to psychotically and violently lash out against them. Did he have personal problems or was it a particular social climate, which triggered his deeds? So far Hick’s motivation isn’t clear, however, empirical studies show evidence that social climate affects personal attitudes, and can drive people to act accordingly – sometimes to extremes. History is full of witch-hunts, racist lynching until recent days where asylum camps burn and refugees got killed by the mob. In many cases this is happening within a climate of stigmatization of the other – who ever that might be in that particular context. These days, even though an FBI report shows that only a small percentage of terrorist attacks carried out on U.S. soil were perpetrated by Muslims, the atmosphere is clearly anti-muslim in the U.S. And, one wonders how much this attitude contributes to provide the mental base for such incidents. Ebola: On The Way Out?